There's jewelry, and then there's fine jewelry, and that, my friends, is a whole beast of its own. Just a few months ago, I had the pleasure of attending the fine jewelry trade shows in Las Vegas, Couture and JCK. Here, I meet with dozens of fine jewelry designers to preview their latest collections for the coming season, and I'm about to give you the lowdown on the trends that stood out from the rest. While I know fine jewelry can often seem a tad unapproachable, it's important to know what is trending in markets both fine and contemporary, as that information informs a lot of the designs for more affordable pieces, but I digress. I know I might be a bit of a fine jewelry nerd, but I am really excited about the fall 2018 jewelry trends, as we are seeing the return of long-lost stones like jade, a major pearl moment, and much more, and I think you will be too. Check out the top six fine jewelry trends for this fall and shop the pieces I'm loving for each. No, these aren't your heirloom pearls. 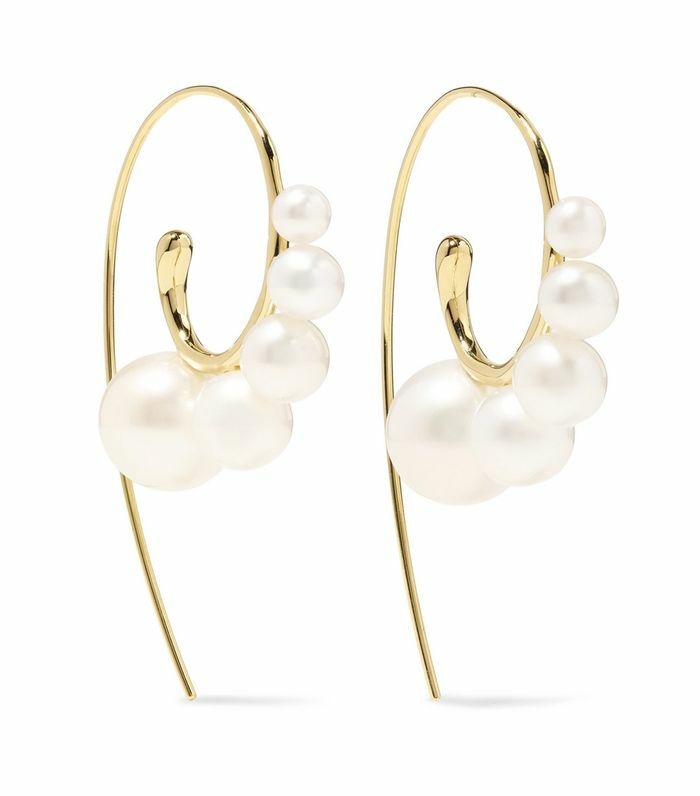 This year, pearls are making a major comeback proving their timelessness in a more modern way. Whether it be on engagement rings, earrings, or tennis bracelets, colored gemstones are having a major moment in the jewelry world. There are already so many pleasant surprises in the ways designers are treating the gems, making the coloring stand out more than ever. Dainty layering pieces are a jewelry trend we expect to have a long shelf life, but this fall, there is definitely a shift in the market, as designers are creating chunkier chains that make a bit more of a statement. Enamel is an easy-to-wear and extremely fun jewelry trend we can't wait to start stocking up on come fall. Basically, enamel is breathing new life into more traditional fine jewelry pieces including everything from bracelets to hoops. There is no denying the shock factor when you hear that jade is officially back. Showing up in a variety of fresh forms, this stone is one we're excited to add to our jewelry collection this fall. Convertible or multifunctional jewelry is something many designers are emphasizing this season, as people are wanting more bang for their buck when it comes to fine jewelry. Think a necklace that has removable earrings, hoops you can wear two ways, and so on and so forth. Next up, here's what a diamond engagement ring costs at every carat size.